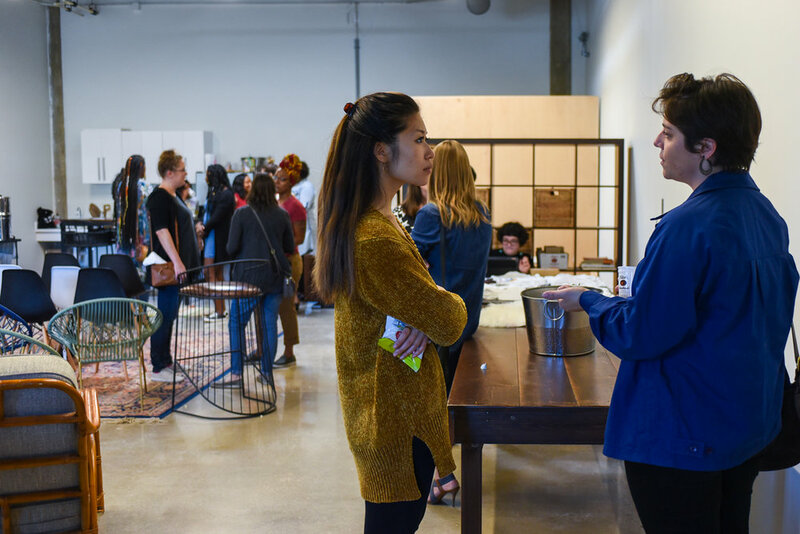 Exploring the intersections of creativity, identity and parenthood, last weekend's SHE TALKS featured a panel discussion on the transformative journey of having children, strategies for self-care and waving one big goodbye to guilt. Held in BBATX’s new HQ on Dec. 1, together we shared notes and talked candidly about our experiences, inspirations and survival tactics. Continue reading to meet our speakers and review a recap of the conversation’s takeaways. Jasmine is a speaker, community organizer and mentor to college mothers. Originally from Houston TX, Jasmine Robinson moved to Austin Texas with her husband and 2 daughters. She earned her Bachelors of Science in Architecture and received her Masters of Science in Community Development at Prairie View A&M University. During her tenure at PVAMU, she produced and directed the only pageant in the world specifically dedicated to college mothers called, the “Ms. Collegiate Mom Scholarship” where she was awarded $6,000 in scholarships from the Student Government Association to give to the 6 women won titles in her pageant. She also served on the Vice President’s Council, mentored high school students through the Panther Peer Mentorship Program, was a Thurgood Marshall Washington DC Travel Scholarship recipient and served as the Vice President of Programs for Students in Free Enterprise while at her alma mater. 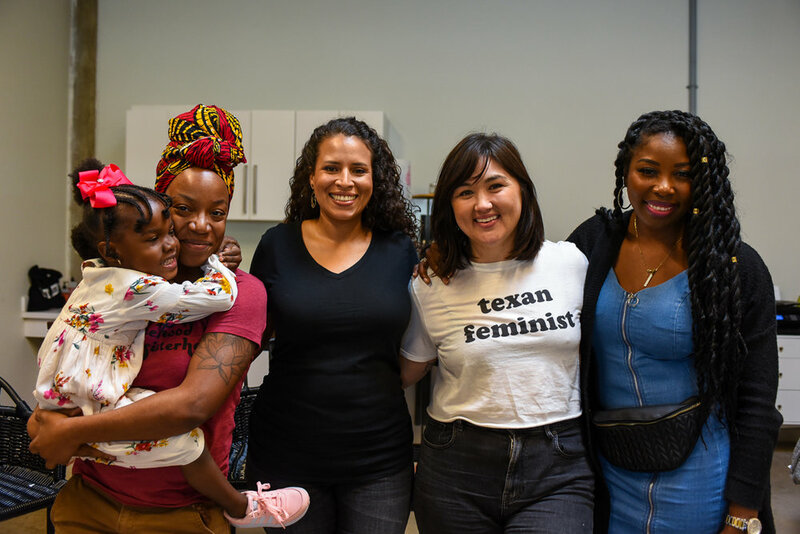 She recently established her non-profit, the Collegiate Mom Coalition (a beneficiary of #bossbabesATX’s upcoming State of the Uterus in January 2019) and is proud to continue serving women by her involvement on the Boss Babes ATX programming committee for 2018. Barbara Vernéus is a counselor, social justice advocate and postpartum doula with Tiny & Brave Holistic Services. She has volunteered overseas in Senegal, West Africa for the African Birth Collective and also in Brooklyn, NY at Dyekora Sumda Midwifery Services as a midwife assistant to midwives. She has also been employed as a Live-Advisor at Pathways PA to teenage mothers. Barbara desires to serve families in the urban community; and overseas, such as Haiti in the near future. Chondra is on #bossbabesATX's Programming Committee. Originally from San Antonio, Texas (Keep San Antonio Lame), she moved to San Marcos to attend Texas State University and graduated with a degree in Environmental Geography and a love for all things related to earth processes (weather, erosion, landforms). Chondra currently works at SXSW Conference and Festival as their Community Events Planner and is building the SXSW LGBTQIA+ representation during the conference. She also sits on the Advisory Board for a queer, inclusive badass tech conference, Lesbians Who Tech. Chondra likes to encourage people to wear their hair curly and embrace body hair. Heather Gallagher is an award-winning and published family photojournalist, editorial and lifestyle commercial photographer based in Austin, TX. With over fifteen years of documenting individuals, families and businesses all over the world, she captures your family or brand authentically and professionally. 1.) Your identity does change with parenthood—as do your relationships, boundaries, needs, etc. It’s OK for those things to change. It’s OK to let go of relationships, working environments and other things that no longer serve you. When we become parents or caretakers, our schedules and lifestyles change accordingly and that often leads us to make different decisions, take our careers more seriously or cut things out altogether. Relinquish that pressure to keep everything the same. 2.) Everyone has different parenting styles—from the choice to breast- and chest-feed to the way you discipline your child—and everyone has unsolicited advice. Your way may not be others’ way. You might not relate to all parents. You might not get along with all parents. You have every right to pursue a community that works for you, without judging what works for others. 3.) No matter what society, friends, family (or even your kids) tell you, you are still you. You deserve time off, you deserve self-care, and you deserve to be your authentic self. 4.) According to the US Department of Labor, as of 2017, 70 percent of mothers are part of the workforce and 40 percent are both the primary caregivers and breadwinners of their household. And despite spending more time at work, mothers are also spending more time than ever on childcare. Even still, care-taking parents report that they feel pressured to be even more involved with their children than they already are. Moreover, sexism, racism, homophobia and other discriminatory beliefs can make parenting even more difficult. Our education systems are often biased and don’t offer full reproductive health education—and our medical system is just as influenced by discriminatory biases as the rest of society. So, if you’re feeling a little pressure to be everything and anything to everyone and anyone at once as a parent, that’s not your fault. That’s a reflection of the bias, taboos and stigmas that still exist. 5.) Work/life balance is a negotiation, and oftentimes completely unrealistic. So, do things in a way that work for you, your needs and your children’s needs. To stay in the loop with our SHE TALKS, check out our upcoming events at bossbabes.org/events or sign up for the BBATX email list.